Osprey Games has found itself a sweet little niche in the current tabletop gaming craze. Games like their extremely popular (and highly-recommend) Frostgrave: Fantasy Wargames in the Frozen City (and now Frostgrave: Ghost Archipelago) and the many titles that have followed, like Dracula's America: Shadows of the West and Scrappers: Post-Apocalyptic Skirmish Wargames, adhere to a similar format of relatively quick, low miniature-count skirmish games with simple but tight, effective rulesets. All of the games feature inexpensive rulebooks loaded with gorgeous fantasy artwork that really helps flesh out the worlds and begs for more narrative wargaming, with a little RPG-like character development and ongoing storylines (all of these games have built-in campaign systems). The games are also all miniature-agnostic, meaning that you can pull minis from any of your favorite ranges. And because the gameworlds are so evocative and interesting--but what you're provided with, so basic--you are heavily encouraged to flesh out the world and the tabletop on your own. In other words, not only are these awesome and fun tabletop skirmish games, they are also games designed to seriously seduce makers and modelers. Osprey's latest, Gaslands: Post-Apocalyptic Vehicular Combat, is a perfect case in point of all of the above, but especially that last point. 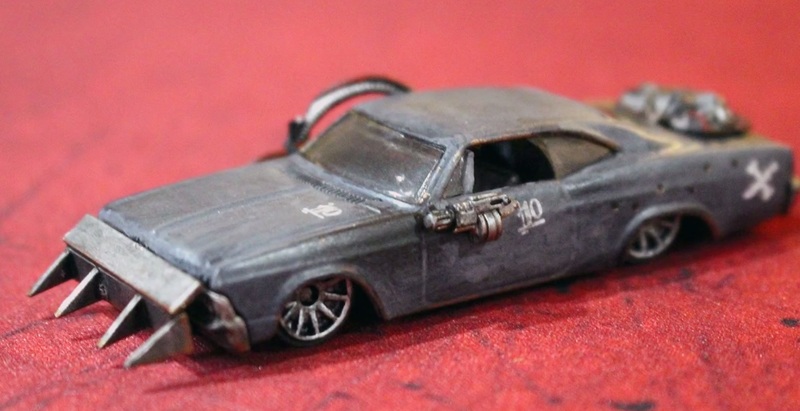 In Gaslands (think: a breezier, less crunchy, more modern Car Wars) there are no ranges of miniatures to draw from. Instead, the game encourages you to Mad Max-ify Matchbox and Hotwheels cars to use in your games. How much fun is this? Lots. Here's a video of Jamie from The Secret Cabal Gaming podcast enthusing over the game, the joys of weaponizing tiny toy cars, and the overall pleasures of miniature painting for gaming.